On-load release mechanisms were introduced as a mandatory requirement for all ships built after 1 June 1986. They are designed to permit the release of a lifeboat from the fall wires when he ship is still making way through the water or in rough seas. However, accident investigations of the past couple of decades have shown an unacceptable high number of failures during drills and inspections that resulted in casualties or injured crew members. A 2006 study for the UK Marine and Coastguard Agency concluded “most of the more serious accidents, particularly those leading to fatalities, occur because of problems with the on-load hooks …. This study found that many existing on-load release hooks, whilst satisfying the current regulations, may be inherently unsafe and therefore not fit for purpose.” It concluded that, as a generality, on-load release hooks were typically unstable. Any fault or problem in the operating mechanism, or an error in its use, leads almost inevitably to release of the hook. In May 2011, IMO adopted into SOLAS Chapter III and the LSA code the Maritime Safety Committee (MSC 89) Guidelines for the Evaluation of Existing On-load Release and Retrieval Systems (OLRRS). The main purpose of the revised code was to prevent unexpected accidents during lifeboat drills and/or inspections. All existing lifeboat OLRRS where required to be evaluated at the earliest opportunity, but not later than July 1, 2013. The evaluation needed to be in accordance with (MSC.1/Circ.1392). New OLRRS requirements for all new and existing cargo and passenger ships took effect on 1 July 2014. At the first scheduled drydock after 1 July 2014 and not later than 1 July 2019 OLRRS must comply with paragraphs 4.4.7.6.4 to 4.4.7.6.6 of the lSA Code or be replaced with equipment that does comply. 4.4.7.6.4 - To provide hook stability, the release mechanism shall be designed so that, when it is fully in the closed position, the weight of the lifeboat does not cause any force to be transmitted to the operating mechanism. 4.4.7.6.5 - Locking devices shall be designed so that they cannot turn to open due to forces from the hook load. 4.4.7.6.6 - If a hydrostatic interlock is provided, it shall automatically reset upon lifting the boat from the water. Only hooks certified and tested in compliance with this SOLAS requirements and named in the IMO Global Integrated Shipping Information System (GISIS) database will be allowed on any lifeboat with on-load hooks. 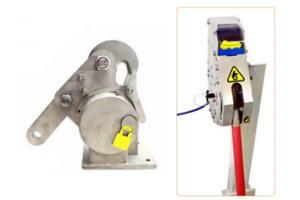 Norsafe’s on-load hook release system, called the TOR MK2, complies with all SOLAS regulations and the LSA code. It has been designed with three main priorities in mind; minimal maintenance, high safety precautions and simplicity of use. A key feature is a yellow padlock sign, visible on both sides of the hook, which indicates that the hook is set and the release cables are correctly located.